Who Can Retire In Their Early 50s With $1 Million? $1 million does not go as far as it used to, but it is still possible to retire early on that amount. The key is to have enough income in retirement to cover expenses. Strong dividend champions are the best bet for achieving enough retirement income. To retire in their early 50s is a dream for many. For those who maxed out their 401(k) plans since they first started working, this dream has become reality for many of them. By taking advantage of employer matching and the 500% plus return of the stock market over the past 25 years, a lot of people are retiring earlier than they ever expected. If a 25 year old begins contributing $10,000 per year with 50% matching and a 5% real return, he will have over $1.3 million by the time he is 54 years old. If he maxes out at $18,000 per year, he will have over $1.8 million. This is the power of 401(k) plans plus compounding at work. It used to be that $1 million was a magical number that guaranteed a safe retirement. That is no longer the case due to inflation and low interest rates. But just because it doesn’t guarantee a stress-free retirement, it doesn’t mean it’s not possible to retire early with $1 million. After running their numbers I found that this couple cannot retire at age 54. 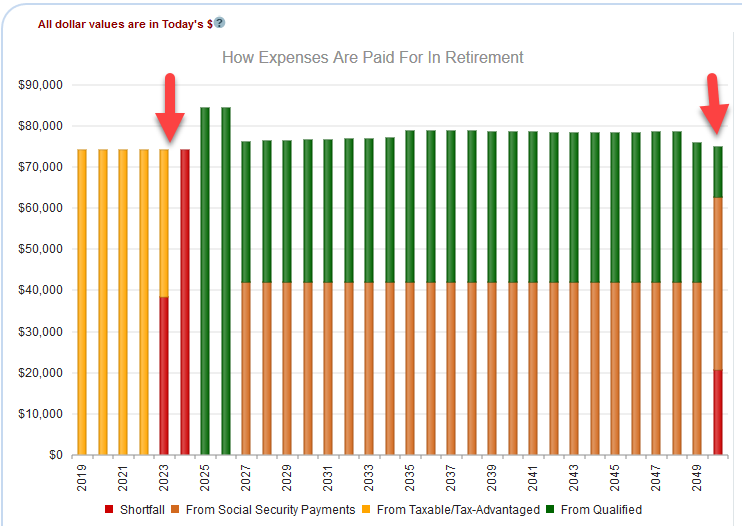 In the chart above you can see that they have a shortfall early on (red bar) and another shortfall later in life. The first shortfall is due to not having enough money in their taxable accounts before they are allowed to withdraw from the retirement accounts without a penalty. The second shortfall is due to them not having enough income to cover expenses in retirement. 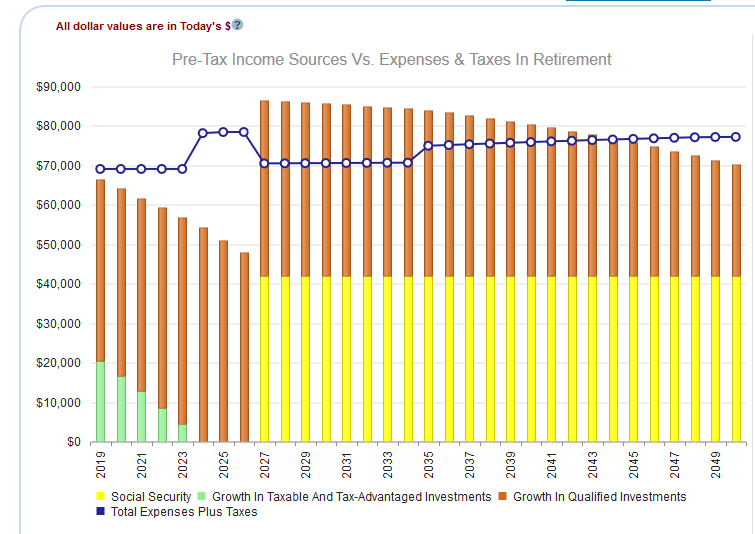 You can see their income vs. expenses in retirement below. 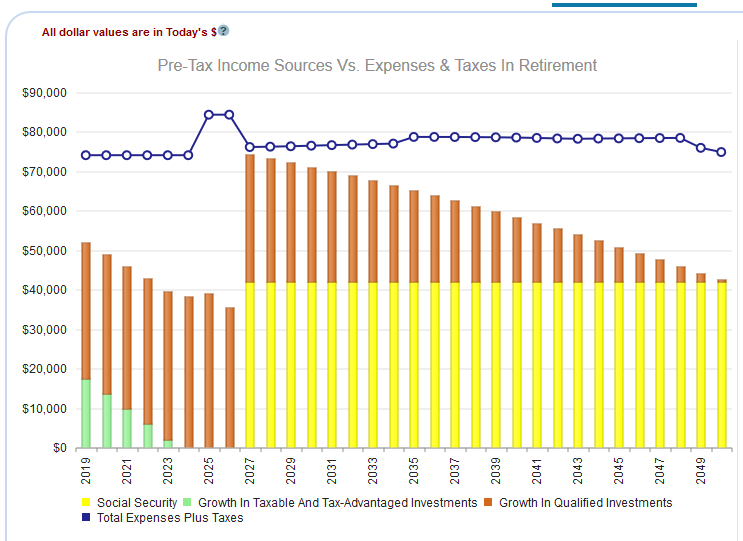 What happens if we reduce the amount they need to withdraw in retirement by reducing their expenses by $5,000 per year? I did this and I also allowed them to withdraw from their retirement accounts with the penalty. You can see in the chart below that they do not have any shortfalls now. However, the amount of money they have left when they reach their life expectancy is only $24,000. 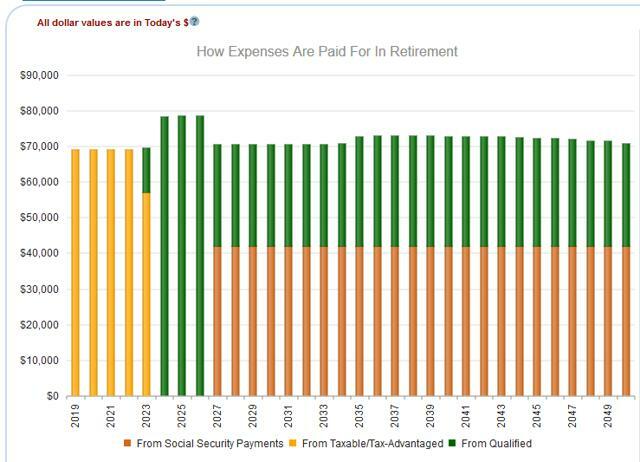 This is way too low and means they barely have any safety buffer at all in retirement. In order to achieve a safety buffer of $300,000 they would need to cut their spending by over $10,000 per year. This couple needs more income in retirement, otherwise they will be eating into their investment principal every year. What we want to do is put together a well-diversified basket of dividend champions that have shown that they will not cut their dividends, even during recessions. A few of my favorites are Exxon (XOM), Walmart (WMT), and Procter & Gamble (PG). These companies actually increased their dividends during the last recession. Now in most years they are able to cover their expenses in retirement with income. They also will now have a safety buffer of over $400,000 when they hit 83 years old. This couple can indeed retire at age 54 if they have enough retirement income. The easiest way for them to generate enough income is to find great dividend payers that allow them to not eat into their principal. Disclosure: I am/we are long XOM, WMT, PG. I wrote this article myself, and it expresses my own opinions. I am not receiving compensation for it (other than from Seeking Alpha). I have no business relationship with any company whose stock is mentioned in this article.